Hope you are having a good week. Can't believe its Wednesday already. Time is flying past!!! 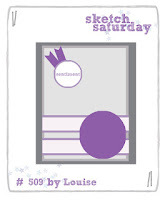 My card today is doing the Progressive Challenge over on Gerda Steiner Designs. This is my first anniversary as I did my first one a year ago!!! I wanted to play with a monochrome feel to the card as I've seen a lot of cards over recent weeks and haven't made one like it myself for ages. Cutie Pie Challenge - Delightful Digis. Get Creative Challenge - No Patterned Papers. Crafting With Dragonflies - Dies or Punches. A super card Hazel, a fabulous black and white design - very striking. Just love the looks on the faces of the gnomes. What a fabulous card - humerous and elegant in the same place. Colour scheme is just perfect. Thanks for sharing with us at Crafting with Dragonflies! Aww how super cute is this? And that little pop of colour really makes all the difference. Thanks for joining in with our Black and White (with or without a splash of colour) challenge at Aurora Wings this time. Good luck. Love this, Hazel - beautifully coloured.